Apparently ‘Canyon del Pato’ is a “must do” for overlanders as the way to get from the coast to the start of the Peruvian highlands. So – today, that’s what we did. The first half of the ride was more of the same dead flat and straight desert road that we were on yesterday. Then we left the lovely smooth asphalt for a shale track through along a river and then up through the canyon. 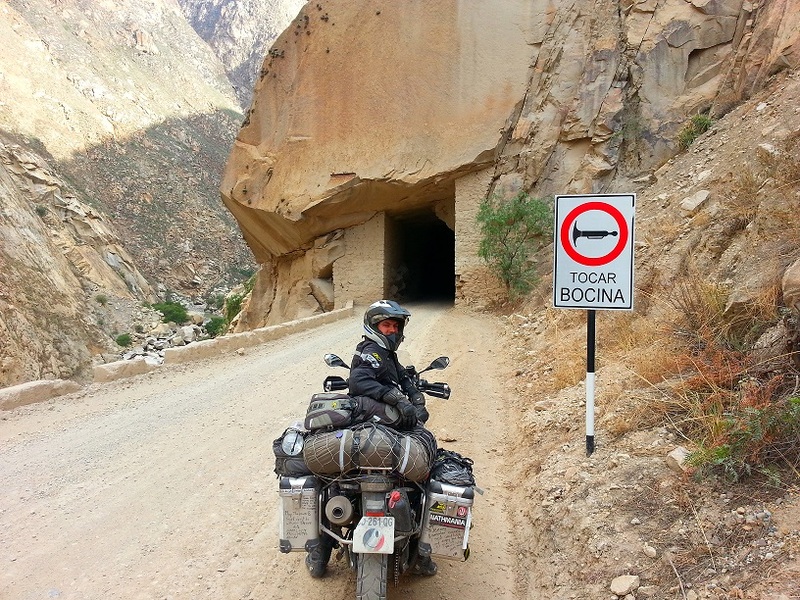 It was part moonscape, part desert, part lush mango forest and about 35 tunnels – definitely an interesting mix! There appeared to by lots of little, local mines… I think mostly coal, but there were also a few that were clearly mining something that wasn’t coal. I was keeping my eyes out for gold nuggets that might be, you know, just lying by the side of the road, or diamond seams in the rock faces around us. No luck on either front. I did see a few locals panning for gold in the river, but the state of the shacks around the place, plus the vast nothingness of the environment would suggest that they hadn’t got terribly lucky yet, otherwise they may not still be out in the middle of the desert – and deserted – canyon. We camped again tonight which was good! Our ‘campground’ was a big grassy square in the back courtyard of a very fancy hotel. It was perfect. Close to the town centre of Caraz, yet really peaceful and we could see some of the mountains and glaciers above us from the tent. The day finished well with an excellent meal and a locally run restaurant just off the main town square. I had the best roast veggies I’ve eaten in ages, and the boys tried a couple of the local specialities. Even the desserts were fantastic! Mmm, good food. I like it. It’s one of the things I miss a bit, so I enjoyed it all the more. This entry was posted in Peru and tagged camping, food. Bookmark the permalink.